Being chronically ill, frankly, stinks. Beyond the obvious troubles that chronic disease brings to patients are the irksome doctor appointments, treatment plans, frequent hospitalizations, and costs. On a mission to change the system is Matt Ethington, the CEO and Founder of ChronicCareIQ and DischargeIQ. Ethington is translating his experiences as a Type I diabetic and seasoned startup founder into a robust set of services that simplify the care of illnesses from medicine’s best new tool – the smartphone. Ethington, who previously founded and built an award-winning company that managed 45 million electronic medical records across two continents, launched his latest healthcare IT startup from both the perspectives of patients and medical providers. ChronicCareIQ is an easy-to-use app that allows patients to report statuses to their healthcare provider, and DischargeIQ helps hospitals reduce readmissions through similar smartphone monitoring. Both products identify and enable early intervention opportunities before a patient’s condition worsens. 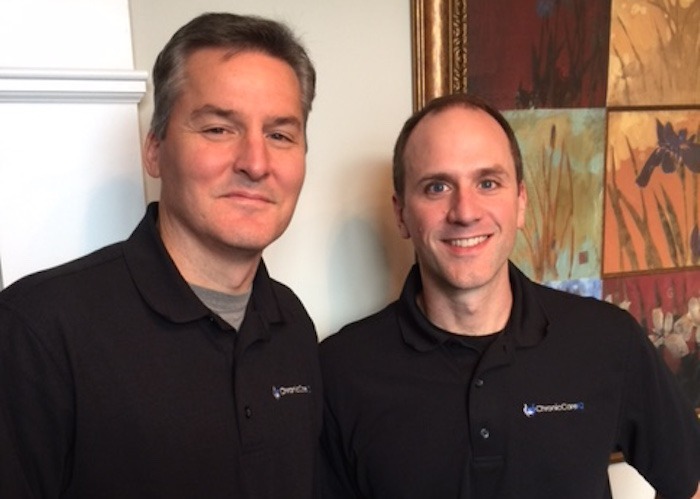 ChronicCareIQ just finished its Series A and is preparing to launch a product upgrade and sales division in January. Excited about their innovative healthcare technology, Ethington and his team gave Hypepotamus a glimpse into the future management of chronic illnesses. What products and services do ChronicCareIQ and DischargeIQ provide? A lot of problems can be addressed through our technology. The app on the smartphone prompts the patient for information about their health; it goes off like an alarm clock that the patient can answer. The patient then answers at their convenience and replies to questions about their health. Our system and the patient responses work within an algorithm, which tracks progress or if a patient is getting worse. A medical assistant or doctor can then provide care as needed. What led to the development of this product, and what research or industry potential did you see? Nearly 70% of Medicare beneficiaries have two or more chronic diseases and that’s bad. But, it’s the problems and complications that come with not properly caring for chronic disease that make it a crisis. Today, they are responsible for 85% of all our healthcare costs and 7 out of 10 deaths. Another big problem is that one out of five seniors admitted to the hospital must be readmitted within 30 days. That number is even higher for some particular conditions. To say these are expensive problems is an understatement. Our doctors are the best-trained professionals in the world. But they can’t be with us all the time. Sometimes waiting out a health problem is a rational thing to do. Sometimes it takes a professional to know the difference, which is why we have 911 and emergency rooms. If you’re four days home from the hospital, you might think some fatigue, shortness of breath and weight gain are normal, but they could be deadly. Or, you could be a Type I diabetic like me that thinks managing my blood sugar on tests conducted every three months is a little slow. So, we created DischargeIQ and ChronicCareIQ. They enable doctors and hospitals to monitor metrics and feedback from high volumes of at-risk patients to prevent little problems from becoming big problems. You are in negotiations with three large healthcare systems, how will they use your product? The three organizations are forward-thinking groups which intend to use our product with their chronic populations to improve quality, lower cost, and increase patient satisfaction. It’s a virtuous cycle that starts with the patient answering a few simple questions when prompted by their smartphone. Based on those responses, our system alerts medical staff to poorly trending patients or those that might require attention. This enables those healthcare systems to proactively determine if a patient should receive attention before it becomes an emergency, or the patient has been hospitalized. That not only reduces healthcare costs of hospitalizations and ED visits, it keeps the patient’s strength up over the long term which further pushes down chronic costs. To reinforce all of this, Medicare introduced a payment reform in January of 2015 called CCM which reimburses doctors and health systems on a monthly recurring basis for non-face-to-face activities like monitoring when undertaken for the care of chronic patients. So, our healthcare systems are leveraging ChronicCareIQ to improve quality, reduce costs, and add net new recurring revenue. We think that’s a win-win. This is your second medical software company, what led you to launch DischargeIQ, now ChronicCareIQ? The first one was just a rocket ship, with 45 million records in a short time. I had three kids under seven during that time too. After our Series A, I took some time off, took a step back and went to work for a telemedicine company. It was there that I saw the need for our product. With smartphones, we carry around more technology in our pocket than NASA used to put us on the moon. We can truly connect care. Being a chronic patient myself, having worked with literally thousands of doctors in ambulatory care, and with strong reimbursement from Medicare, it just seemed like technology could all come together and make a big difference. Also, increasingly, more elderly people are living alone and longer. We have a good family friend that my kids call Grandma Johnson. She has diabetes and heart failure. You couldn’t find a family with more love. Her adult children call daily to check in, but she is a strong independent woman who doesn’t want to bother anyone. Therefore, no one knew her heart failure was decompensating until she was admitted to the hospital for 6 days and that scared everyone. I asked her, “Would you be willing to answer a few questions on your iPhone every day?” She said she’d feel more secure knowing her doctor was looking over her responses, so we’re going to set her up with ChronicCareIQ. Where do you see ChronicCareIQ going in 2016? Beginning in 2016, we will work with the physicians who are helping the underserved populations and providing care management but are not currently getting reimbursed for their time. Some of the most fragile patients are cardiac patients, and we can help them. We also just launched with one of the largest free-standing medical research facilities in the world, the Texas Liver Institute.